US President Donald Trump has nominated William Barr to be the new attorney general, a post he held in the 1990s. By replacing Jeff Sessions, who was fired by Trump last month, the 68-year-old will take charge of the investigation into alleged Russian meddling in the 2016 US election. US media report he has been critical of some aspects of that inquiry. A well-known conservative lawyer, Barr held the role under President George H W Bush from 1991 to 1993. The president called him a "highly respected lawyer" by both Republicans and Democrats and "a terrific man" while speaking to reporters on the White House South Lawn. In the same statement, Trump confirmed reports he is pushing for Heather Nauert to be the new US ambassador to the United Nations. Currently, Barr is counsel at the Kirkland & Ellis law firm in Washington DC. If Barr is confirmed by the senate after his official nomination, he will replace the current acting attorney general, Matt Whitaker. Whitaker had been a controversial pick from the start due to his views on Special Counsel Robert Mueller's inquiry. Trump has repeatedly lashed out at the investigation, calling it a "witch hunt". When he selected Whitaker to replace Jeff Sessions, who had recused himself from the inquiry, Democrats feared Whitaker would bring an end to the special counsel's work. Democrats say they will definitely press Barr on his views regarding protecting Mueller and his work, during his confirmation hearings. Will Democrats derail his appointment? 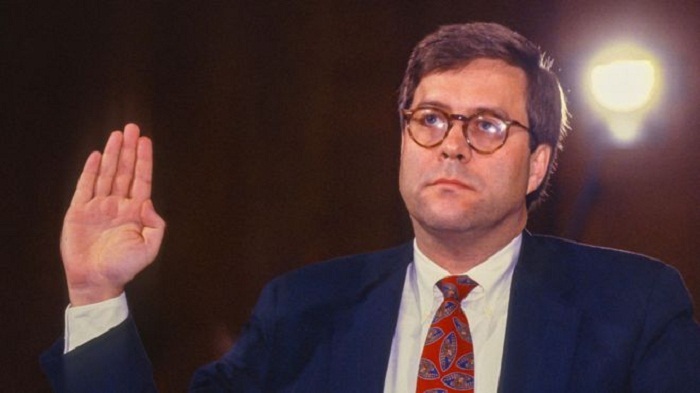 On paper William Barr looks like a safe pick for US attorney general. Since serving under George HW Bush, he's spent most of his career as a corporate lawyer, so he's more than familiar with Washington's corridors of power. Barr is the kind of nominee Senate Republicans - whose votes will be needed for confirmation - know and are comfortable with. He's not exactly a drain-the-Washington-swamp choice, but that has never been a priority in the gilded halls of the upper chamber of Congress. This, of course, is no normal time - and it didn't take long for interested parties to scour Barr's recent comments and writings in search of any meaningful hints on how he would oversee Robert Mueller's Russia investigation. Democrats won't be encouraged to learn that he expressed support for Donald Trump's firing of FBI Director James Comey and recommended further investigation of Democrat Hillary Clinton. It's going to be months before Barr receives a Senate vote, and the scouring will surely continue. Contentious confirmation hearings are all but a given. This, however, is a nomination that will be difficult for Democrats to derail. The 68-year-old Republican lawyer has an impressive political resume, spanning the CIA, White House and Department of Justice. Barr holds degrees in government and Chinese studies from Columbia University. While studying law at George Washington University, he worked at the CIA from 1973-1977. As a young lawyer, he clerked for the DC appeals court. For a year, Barr was a member of President Ronald Reagan's domestic policy staff at the White House; a role he eventually left to pursue corporate law. In 1989, he was appointed by President Bush to head the Justice Department's Office of Legal Counsel. He was promoted to deputy attorney general next, and then to the top role. After passing his senate confirmation hearing unanimously, he served as the 77th US attorney general from 1991-1993. As the top US law official at that time, he oversaw Robert Mueller, who was then leading the department's criminal division. Barr retired from his position as counsel and executive vice-president of Verizon in 2008. What has he said about the Russia inquiry? Barr has voiced disapproval over some aspects of the inquiry but his views on the investigation's legitimacy remain unknown. He has said that Robert Mueller hired too many prosecutors with Democratic campaign ties for his investigative team - telling the Washington Post he "would have liked to see [Mueller] have more balance". In a 2017 opinion piece for the Post, Barr said Trump had been right to fire FBI director James Comey because he "crossed a line" by announcing the outcome of the investigation into Hillary Clinton's emails. He has also defended Trump's desire for a criminal investigation against Hillary Clinton to the New York Times, adding that some of her actions merited an inquiry more than any Trump-Russia collusion. The Times has described Barr as a lawyer with a vision for broad presidential powers, but also one who sees the attorney general's duty as avoiding political considerations. On Twitter, many are wondering why Barr chose to accept the role again, and what he might make of Trump's latest tweets deriding the Russian inquiry. Democratic Senator Richard Blumenthal has already called for Barr to firmly commit to protect Mueller's investigation. Fellow Democrat Patrick Leahy of Vermont said he has known Barr a long time and hopes he will "unambiguously commit" to protecting the inquiry and upholding the law. Leahy was a senator during Barr's first confirmation. Republicans, meanwhile, have praised Trump's pick. South Carolina Senator Lindsey Graham, the likely new judiciary committee chair, said Trump had made an "outstanding decision" with Barr, adding he would work to hasten his confirmation. Republicans will have a 53-47 majority in the Senate, and only a simple majority is needed to confirm the appointment. Senator Roy Blunt of Missouri said Barr was "exceptionally well-qualified" for the position. Former House Speaker Newt Gingrich described Barr as "solid and professional". The American Civil Liberties Union (ACLU), which has spearheaded a number of lawsuits against the Trump administration, said that Barr could continue Sessions' "legacy of hostility to civil rights". "Barr must commit to defending the rule of law and civil rights, not serving as a political arm of Trump's anti-constitutional agenda," said Faiz Shakir, national political director, in a statement.